in 25 acres of outstanding natural beauty. Book a whole day’s fun including archery target practice, target paintballing and archery paintballing games in the woods. 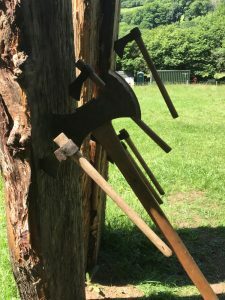 If there’s any time left over you can also have a go at axe throwing! Children over 8 years welcome in the company of an adult. My Partner and I book a half day for my birthday which included Archery , axe throwing , knife throwing and bull whip cracking. It was an extremely relaxing and chilled out day with excellent instruction from Gordon. I will definitely be booking again and would highly recommend this to anyone, of any level of experience. Thanks for the great day Gordon see you again soon. Gordon was as informative and patient as he was when our family wanted to do archery last year. The very fact we went back to him is testimomony to that. 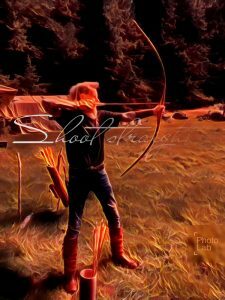 My brothers were able to shoot higher-powered bows too, which clearly they both enjoyed, and my mother (77), sister-in-law, and son, niece and nephews all were beaming at the end. Bravo, Gordon!